The Theotokos is considered by Orthodox Christians to be the Abbess of all the monasteries on Mount Athos. She oversees the welfare of the monasteries as well as the monks who have dedicated their lives to imitating her through humility, obedience and purity. One way she has manifested her divine protection throughout the Holy Mountain is through her many wonderworking icons in the various monasteries and churches. The most famous and celebrated icon of the Theotokos on the Holy Mountain is without a doubt the icon known as "Axion Estin". The church that houses the icon of Axion Estin is in Karyes, the capital of Mount Athos, in a church called Protaton. It is called Protaton because it was the first church built on the Holy Mountain in 843 AD by Saint Athanasios the Athonite ["Protaton" means "the first"]. The iconography of the church seen today was done in the 13th century by the renowned iconographer Emmanuel Panselinos. The miraculous appearance of the Archangel Gabriel revealing the hymn Axion Estin. It was after this miraculous occurrence that the icon of the Theotokos was transferred to the church in Protaton. The cell where the miracle happened is known today by the name "Axion Estin" as well. The miracle took place on June 11, 982 on a Sunday. The miraculous brick on which was transcribed the hymn of Axion Esti was transferred to the Patriarchate of Constantinople and displayed for veneration by the faithful in the imperial palace Church of Saint Stephen. From then on the hymn Axion Estin became a staple within the Divine Liturgy and other services of the Church. The icon is especially celebrated with festivities and a procession on Bright Monday after Pascha and many miracles take place on this day. The icon itself is a bit faded, but covered in a silver sheath to protect it. It has been recently restored and is now in good condition. It bears the inscription "Μήτηρ Θεού Καρυώτισσα" or "Mother of God Kariotissa". Its origins are probably from Constantinople and is of the Panagia Eleousa type first painted by the Apostle Luke. On October 3, 1913 after an all-night vigil in the Protaton church, the self-governed region of the Holy Mountain became part of the Greek state after a decree was signed by the Abbots of the monasteries in the presence of and after doing a prostration before the miraculous icon of Axion Estin. This was done according to the international treaties of London (1913), Bucharest (1913), Neuilly (1919), Sèvres (1920) and Lausanne (1923). The Decree, "made in the presence of the Holy Icon of Axion Estin", stated that the Holy Mountain recognised the Kings of Greece as the lawful sovereigns and "successors on the Mountain" of the Roman "Emperors who built" the monasteries and declared its territory as belonging to the then Kingdom of Greece. On the one thousand year anniversary of Mount Athos in 1963, the icon of Axion Estin left the Holy Mountain for the first time to be venerated in Athens by thousands of faithful. In 1985 it was brought to Thessaloniki aboard a military ship and received there with the same honors as a Head of State. During the Greek Revolution of 1821, before the great catastrophe that took place on the island of Chios, the Turks pillaged the monasteries of the island of their wealth. 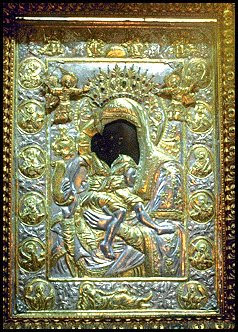 One day a Turk happened upon two Greeks who were trying to save the treasures as he was holding an icon of the Theotokos. He told the Greeks: "Take this Mariam" (the Turks call the Virgin "Mariam"). The Greeks didn't understand why the Turk was giving them the icon. He went on to say: "I tried with my sword to cut this icon in pieces so as to throw it in the fire, but every time I went to chop it nothing would happen to the icon. I looked carefully at the icon and I noticed it smiled at me. I understood your faith is great and this icon should not be destroyed. Take the icon and put it in your church." Ye hosts of the Fathers of Mount Athos, gather today, and shout with a voice of jubilation, leaping for joy, and faithfully keeping feast: For, behold, the praise of the most pure Theotokos wondrously and awesomely is sung by the Angel; and therefore, as the Mother of God, we glorify her name. All of Athos keepeth feast this day in gladness; for it wondrously received from an Archangel's holy hand the hymn whereby thou hast ever been praised as the Mother of God, as is truly meet.